My first exposure to Dr. Atul Gawande was handed out to me in my Accounting Communications class. The professor was an avid reader – although it was an accounting class, the college makes a point of having English professors teach the class. Professor Leslie constantly brought us delightful little nuggets of information to help propel us along our careers. 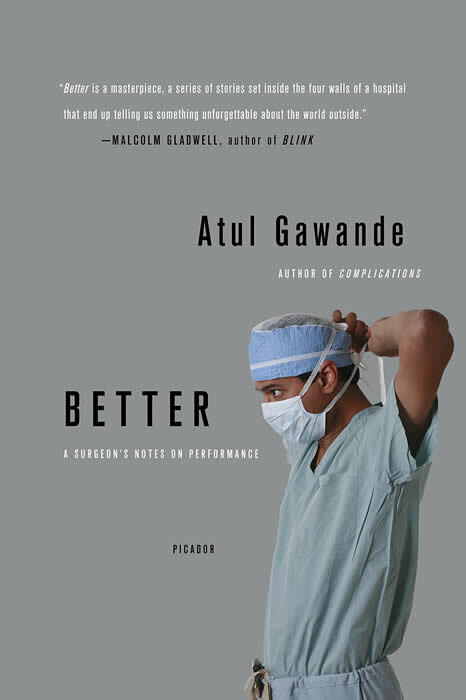 One of these actually turned out to be the last section of Better: A Surgeon’s Notes on Performance by Dr. Gawande. It’s titled “Suggestions for Becoming a Positive Deviant” and includes a multitude of tips on how to improve yourself (one of them, I’d like to note, is “write something”). Intrigued by the contents of this little section and a hearty recommendation by the professor, I picked up Better a few months later. As I was checking out, the clerk cheerily informed me that it was one of his favorite books. It turned out that he was in medical school and working at Borders part time. His other top four books included the infamous Grey’s Anatomy (no, not the TV show) and various other medical books, so it’s not a surprise that this one made the list. Better gives a brief look at what’s on the other side of the veil, at what doctors have to put up with and some issues they have to contend with. The majority of the book is, unsurprisingly, based around the medical field.﻿﻿ It covers a range of delightful, uplifting topics such how to make doctors and nurses wash their hands more often so they don’t infect (and kill) their patients, how messed up our malpractice system is in the United States, and the doctors behind the death penalty. Sarcasm aside, Dr. Gawande has the unique ability of interweaving statistics with his own personal story and, for good measure, some self-improvement tips. He lumps his stories together under a few categories, such as “diligence,” “doing right,” and “ingenuity,” although I have to admit that they seem sort of tacked on to the end. The afterword (“Suggestions for Becoming a Positive Deviant”) wrap all these up in a nice tidy package, so if you’re looking for a concise summary of the book I’d suggest just reading that at your local Borders. Overall, the book is enjoyable; doubly so if you are interested in the medical field. We all have someone in the family or a friend of a family that is a surgeon, nurse, or currently slogging through medical school. Buy it for them, then steal it back for a week and read it yourself.